Gabapentin and pregabalin are medicines used in the treatment of epilepsy and neuropathic pain. Gabapentin is also used to treat hot flashes and restless legs syndrome and pregabalin has been used to treat fibromyalgia and generalized anxiety disorder. Both are commonly prescribed, both are effective and, for those reasons, both drugs play an important role in the clinical setting. 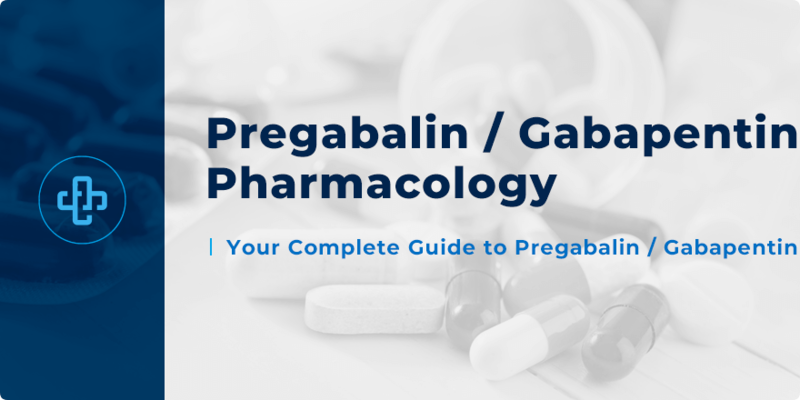 Here, we’re going to review the clinical pharmacology of gabapentin and pregabalin; summarizing the fundamental facts that you should know. Both gabapentin and pregabalin are used to treat focal epilepsies (with or without secondary generalizations). Typically, either drug is prescribed as an “add on” to another anticonvulsant drug – such as carbamazepine. As we learned in the introduction, pregabalin is effective at treating neuropathic pain. This is particularly true for patients who suffer from diabetic neuropathy (however, patients are likely to be prescribed duloxetine as the first-line agent for this condition). Pregabalin, unlike gabapentin, can be used to treat generalized anxiety disorder. Gabapentin has also been used to treat diabetic neuropathy. The precise mechanism of action of gabapentin or pregabalin is not fully understood. Gabapentin has structural affinity to GABA, the primary inhibitory neurotransmitter of the brain. Pregabalin is itself a structural analog of gabapentin. It is thought that both drugs reduce neuronal excitability by binding to voltage-gated calcium channels rather than through their relatedness to GABA. Both drugs are well tolerated – at least when compared to other anticonvulsant drugs. Common side effects of both medicines include drowsiness, dizziness and ataxia (lack of voluntary control over muscle movements). These side effects do, however, improve over time. Both drugs are linked to an increased suicide risk. The fact that both drugs rely on the kidney for their elimination. Consequently, doses should be reduced in those with renal impairment. Sedative effects of both drugs are enhanced when taken with other sedating drugs – antidepressants, benzodiazepines etc. Compared to other anticonvulsant drugs, pregabalin and gabapentin have few serious drug interactions. This makes them an ideal alternative in many complicated clinical scenarios. Dose should be increased incrementally to improve tolerability. Similarly, abrupt withdrawal of either medicine is linked to physical dependence. Want to learn more about gabapentin or pregabalin? Test your knowledge today by joining our member’s area – quiz questions, flashcards, pharmacy case studies, tutorials, infographics, pharmacology mnemonics and more! Check back to our pharmacy blog for even more great study tips!